Question 1. Indicate whether the following statements are True (T) or False (F). Question 2. Make a sketch of the human nerve cell. What function do nerve cells perform?. 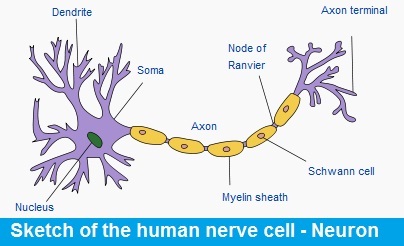 Answer: Human nerve cell, also known as neuron, are branched like structure. A typical neuron possesses a cell body (often called the soma), dendrites, and an axon. Dendrites are thin structures that gives rise to a complex "dendritic tree". An axon is a special cellular extension that arises from the cell body at a site called the axon hillock. The cell body of a neuron frequently gives rise to multiple dendrites, but never to more than one axon, although the axon may branch hundreds of times before it terminates. Functions : The nerve cell or neuron processes and transmits information through electrical and chemical signals, thereby helping to control and coordinate the working of different parts of the body. Neurons are the core components of the nervous system, which includes the brain, spinal cord, and peripheral ganglia and play a vital role in Sensing touch, sound, light and other through sensory organs that then send signals to the spinal cord and brain. Motor neurons receive signals from the brain and spinal cord, cause muscle contractions, and affect glands. Interneurons connect neurons to other neurons within the same region of the brain or spinal cord. Nucleus of a cell : It is an important component of the living cell. It is generally spherical and located in the centre of the cell. It can be stained and seen easily with the help of a microscope. Nucleus is separated from the cytoplasm by a membrane called the nuclear membrane. This membrane is also porous and allows the movement of materials between the cytoplasm and the inside of the nucleus. In addition, nucleus contains thread-like structures called chromosomes. These carry genes and help in inheritance or transfer of characters from the parents to the offspring. The chromosomes can be seen only when the cell divides.Nucleus, in addition to its role in inheritance, acts as control centre of the activities of the cell. Question 4. Which part of the cell contains organelles? Answer: Cytoplasm, which is a jelly-like substance between the nucleus and the cell membrane, contains organelles.Organelles which are also called "little organs", are usually membrane-boundand and includes mitochondria, golgi bodies, ribosomes etc. Question 5. Make sketches of animal and plant cells. State three differences between them. taking up 90% of cell volume. Question 6. State the difference between eukaryotes and prokaryotes. Answer. Eukaryotes ( eu + karyon meaning true nucleus ) are made up of eukaryotic cells, which,like onion cells and cheek cells have a well organised nucleus with a nuclear membrane . . All organisms other than bacteria and blue green algae are called eukaryotes. Where as Prokaryotes (pro + karyon - primitive nucleus) are made up of prokaryotic cells, in which nuclear material exists without nuclear membrane. The organisms with these kinds of cells are called prokaryotes. These are of type primitive nucleus. Examples are bacteria and blue green algae. Question 7. Where are chromosomes found in a cell? State their function. Answer : Chromosomes are found in nucleus.They are thread-like structures carry genes and help in inheritance or transfer of characters from the parents to the offspring. The chromosomes can be seen only when the cell divides. Question 8. ‘Cells are the basic structural units of living organisms’. Explain. Answer :Every living organism has many organs, which performs different functions such as digestion, assimilation and absorption. Different organs of perform specific functions. For example, roots help in the absorption of water and minerals.Leaves, are responsible for synthesis of food. Each organ is further made up of tissues which in turn, are made up of cells. This is for the reason, why in in a living organism, cell is the basic structural unit. Question 9. Explain why chloroplasts are found only in plant cells? Answer : The chloroplasts are found only in plant cells, because, chloroplasts contain green pigment called chlorophy, which is essential for photosynthesis in plants leaves for making food. As we know there are several small coloured bodies in the cytoplasm of the cells of plant leaf. They are scattered in the cytoplasm of the leaf cells. These are called plastids. They are of different colours. Some of them contain green pigment called chlorophyll. Green coloured plastids are called chloroplasts. All organisms are made of smaller parts called organs. Organs are made of still smaller parts. The smallest living part of an organism is a ‘cell’. Cells were first observed in cork by Robert Hooke in 1665. Cells exhibit variety of shapes and sizes. Number of cells also varies from organism to organism. Some cells are big enough to be seen with the unaided eye. Hen’s egg is an example. Some organisms are single-celled, while others contain large number of cells. The single cell of unicellular organisms performs all the basic functions performed by a variety of cells in multicellular organisms. The cell has three main parts, (i) the cell membrane, (ii) cytoplasm which contains smaller components called organelles, and (iii) the nucleus. Nucleus is separated from cytoplasm by a nuclear membrane. Cells without well organised nucleus, i.e. lacking nuclear membrane, are called prokaryotic cells. Plant cells differ from animal cells in having an additional layer around the cell membrane termed cell wall. Coloured bodies called plastids are found in the plant cells only. Green plastids containing chlorophyll are called chloroplasts. Plant cell has a big central vacuole unlike a number of small vacuoles in animal cells. It's a great help. There are few gramatical mistakes.